This amazing gaming system was a Core i7 980x Hex-Core 3.33GHz CPU, running 12GB of Corsair Dominator DDR3, dual GTX 480s, and multiple hard drives and a solid state drive–all powered by a 1200W power supply and running on air. Despite the dozen or so large fans that came with the case and various installed components, and despite the nice after-market CPU heatsink and fan, the system was running LOUD and HOT out of the box. There was no room for overclocking due to the heat, either. Tiger Custom Computers was commissioned to install a water-cooling solution to get the noise and temperatures under control. We used water blocks and reservoirs from EkWaterBlocks (http://www.ekwaterblocks.com) in addition to cooling fans and accessories from FrozenCPU (http://www.frozencpu.com). The plan was to create one large “loop”, a single circuit that the water would course through to cool all of the major components of the system. We would install a waterblock on the CPU, the motherboard chipsets, and both graphics cards. A pump head with integrated reservoir would drive the distilled water throughout the system. The cooling would be provided by two radiators; the primary would be an EKWB CoolStream RAD XTC 420–a beast of a radiator with mounting points for 3x 140mm fans on each side, so that six total fans could be attached to it. This would cool the water before reaching the CPU/motherboard portion of the loop. From there, the heated water would go to a secondary radiator, an EKWB CoolStream RAD XT 240–mounting 2x 120mm fans on each side–and then pass through both graphics cards before heading back to the pump/reservoir and then re-entering the loop. When it was running on air and the case was buttoned up, the CPU idled around 40C and the GPUs were idling around 45C. Under full 100% load on all 6 cores and HyperThreading enabled, and with the GTX 480’s under full load in SLI, the CPU core temperatures were hitting 65-70C and the GPUs were hitting 95-100C, almost voiding the warranty on the graphics cards. On air–CPU: 40/70C, GPU: 45/100C. All of these temperatures were examined after several hours of stress-testing, and the noise from the system was like a muffled hair dryer–not pleasant to be around, even when it was under the desk. 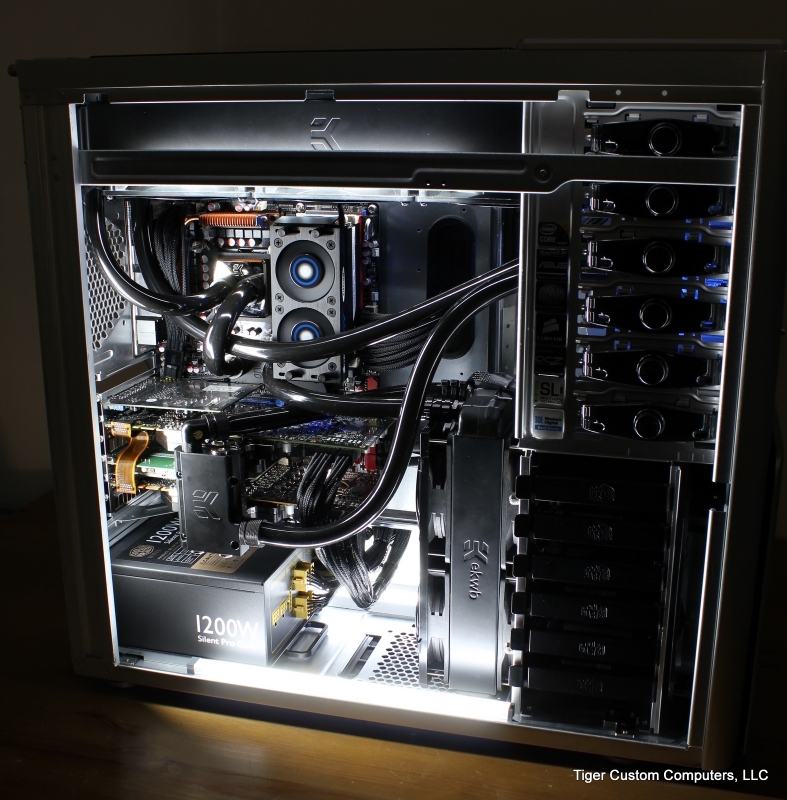 After we installed the water-cooling system the idle temperatures dropped significantly. The CPU now idled at 19-22C, and the GPUs at 35C. I felt that this was a decent decrease, but the results under load were remarkable. After four straight hours of 100% load on all CPU cores and both graphics cards, the temperatures on water were much lower. On water–CPU: 20/57C, GPU: 35/65C. All the better, even with the radiator fans running at 100%, the system was no louder than my own pleasantly quiet desktop. Taking the side of the case off dropped all of the temperatures another 8-10C, but made almost no audible difference in the noise level. Dropping the fans to 40% quieted the system to virtual silence, and the temperatures only increased 3-4C. The results–in cooling performance, sound levels, and visual aesthetics–were stunning. The client “could not be more pleased” with the end product.